Paris - Senegal speedster Sadio Mane made a stunning return after injury by setting up two goals for Egyptian Mohamed Salah as Liverpool crushed West Ham 4-1 at the weekend. Mane now switches his attention to the World Cup with Senegal needing a win in South Africa this Friday to seal a place at the 2018 finals in Russia. Oumar Niasse completed a great weekend for Senegalese players in the English Premier League by scoring the goal that triggered a 3-2 comeback win for struggling Everton over Watford. The Egyptian forward netted his 11th and 12th goals since joining Liverpool in a 4-1 win away to West Ham. Salah steered the ball past Joe Hart for his team's opener after a fine run from Mane and finished the rout following another Mane assist. 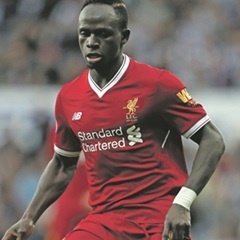 The flying Senegalese front man showed Jurgen's Klopp side what they have been missing since he has been out injured, producing a sparkling display on his return against West Ham. Mane, who has not played for the club since early October, provided assists for both of Salah's goals. Launched the Toffees' fightback from 2-0 down by scoring their opening goal in an eventual 3-2 win over Watford. The Senegal forward latched onto Ademola Lokman's pass took it past the onrushing Watford goalkeeper and forced the ball in. Partey is now Atletico's joint top-scorer for the season as his 91st-minute strike snatched all three points from another lacklustre display from Los Rojiblancos in a 1-0 win at Deportivo la Coruna. The versatile Ghana midfielder now has four for the season, one more than Atletico's star forward Antoine Griezmann. Algerian playmaker Boudebouz bagged his first Betis goal with a sweet hit from 25 yards to cap a comeback from 2-0 down to grab a 2-2 draw at home to Getafe. Boudebouz has yet to start a game since making a reported seven million euro (about $8.1 million)move from Montpellier in August, but finally made an impact off the bench. The Togo striker, who scored twice in last week's 4-2 shock win over Borussia Dortmund, provided a superb cross as Jonathas gave Hanover the lead at RB Leipzig in a 2-1 defeat. Second-half goals by Yussuf Poulsen and Timo Werner sealed Leipzig's comeback win which left them second, four points behind leaders Bayern Munich. The Guinea midfielder came off the bench to help Leipzig come from behind in their 2-1 home win against Hanover, but is in trouble with German police for allegedly attempting to obtain a driving licence with forged documents. The 22-year-old, who will join Liverpool next season, is accused of twice trying to use a forged Guinea licence to try to obtain a German driving permit, which carries a six-figure fine in Germany. The Gabon hot-shot's goal drought extended to five games as he drew another blank in a 3-1 defeat at home to leaders Bayern Munich. Aubameyang could not hit the net with his three shots at goal against Bayern, whose striker Robert Lewandowski claimed his 11th goal in as many games to become the league's top scorer, one ahead of Aubameyang. The 22-year-old Ivorian scored his first goals of the season in a 3-0 victory at bottom club Metz, as Marcelo Bielsa's struggling Lille recorded a first win since the opening weekend. Pepe converted a penalty on the stroke of half-time to open the scoring before netting his second of the match three minutes from time.